I used to always sneak and use my mom's tweezers when I was younger...tweezerman tweezers seem to last forever and they are great for gripping even the tiniest hairs. However, they're a bit pricey, but a good investment. They are so precise that it really cuts down on pinching. After using Tweezerman's mini slant tweezers for a few years I bit the bullet and purchased the full size. I am so glad that I upgraded! Unlike the minis, these come with free lifetime sharpening services from Tweezerman, which means that this will (assuming I don't lose these!) be the last pair of tweezers I will ever buy. A brand that stands behind their product with a lifetime service like t...read morehat is wonderful and refreshing. That aside, these are amazing tweezers. The longer handle makes these super easy and comfortable to use. 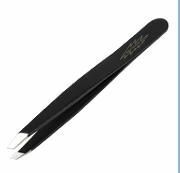 The razor sharp tweezers are precise and grab even those short, difficult hairs. I picked these up in red and they are classic and a little fun. The quality of these tweezers is top notch. If I lost these I would immediately run out and buy another pair. Other brands of tweezers I have tried can't even compare. These tweezers get every hair. There are no cons. They also have a lifetime warranty with free sharpening and are made in the USA.